Posted by Shikha Chaganti on Monday, February 1, 2016 in Abdomen Imaging, Computed Tomography, Image Segmentation, Multi-atlas Segmentation. 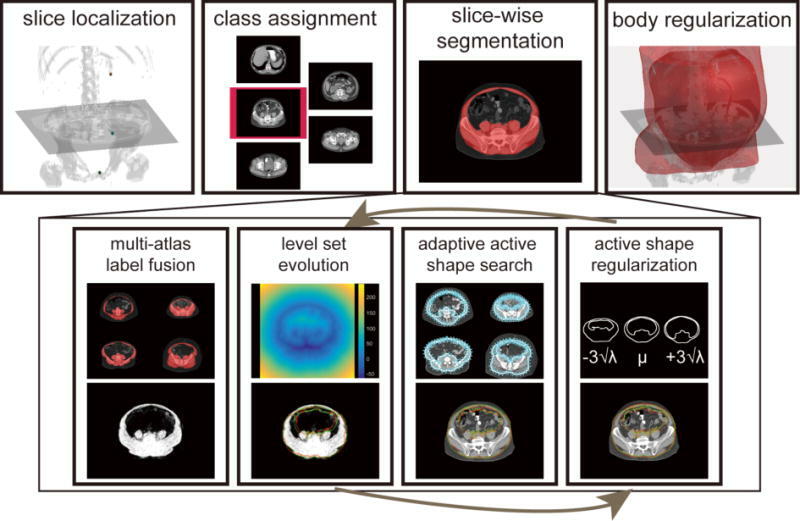 Zhoubing Xu, Rebeccah B. Baucom, Richard G. Abramson, Benjamin K. Poulose, Bennett A. Landman, “Whole Abdominal Wall Segmentation using Augmented Active Shape Models (AASM) with Multi-Atlas Label Fusion and Level Set”, In Proceedings of the SPIE Medical Imaging Conference. San Diego, California, February 2016. Oral presentation. The abdominal wall is an important structure differentiating subcutaneous and visceral compartments and intimately involved with maintaining abdominal structure. Segmentation of the whole abdominal wall on routinely acquired computed tomography (CT) scans remains challenging due to variations and complexities of the wall and surrounding tissues. In this study, we propose a slice-wise augmented active shape model (AASM) approach to robustly segment both the outer and inner surfaces of the abdominal wall. Multi-atlas label fusion (MALF) and level set (LS) techniques are integrated into the traditional ASM framework. The AASM approach globally optimizes the landmark updates in the presence of complicated underlying local anatomical contexts. The proposed approach was validated on 184 axial slices of 20 CT scans. The Hausdorff distance against the manual segmentation was significantly reduced using proposed approach compared to that using ASM, MALF, and LS individually. Our segmentation of the whole abdominal wall enables the subcutaneous and visceral fat measurement, with high correlation to the measurement derived from manual segmentation. This study presents the first generic algorithm that combines ASM, MALF, and LS, and demonstrates practical application for automatically capturing visceral and subcutaneous fat volumes. Flowchart of the proposed AASM approach for whole abdominal wall segmentation. For a target volume, XP, SP, and UB are localized by random forest, based on which, each axial slice between XP and SP is extracted and assigned to one of five classes. The slice-wise segmentation uses region-based LS to evolve on the probabilistic estimation obtained by MALF to augment the traditional active shape search by global optimization. The active shape regularization preserves the abdominal wall topology. Note the red and green markers at the bottom row indicate the landmark positions before and after the operation of the associated block. Body regularization is achieved by 3D Gaussian smoothing the collected slice-wise segmentation.